Performance will be achieved using a maximum cartridge length of 2.800” to allow magazine length loading in short action rifles designed to support the 308 Winchester and similar cartridges. Performance will be achieved using currently available hunting bullets from mainstream bullet manufacturers – Speer, Nosler, Sierra, Hornady and Barnes. Performance from match bullets, not designed for hunting, will not be considered. The cartridge will achieve an Effective Range to a minimum of 300 yards with multiple hunting bullets. The Effective Range being defined as bullets having an On Target Velocity at 300 yards greater than 1800 fps – the minimum bullet manufacturer recommended velocity requirement to insure reliable expansion. Maintain a trajectory with the bullet flight path being no higher than 3 inches and no lower than 3 inches from the point of aim. Wind drift due to a 3 mph 90 degree angle crosswind must not exceed 3 inches from the point of aim. It is generally considered that it takes a 4 mph wind for there to be any visual or physical indication of wind. 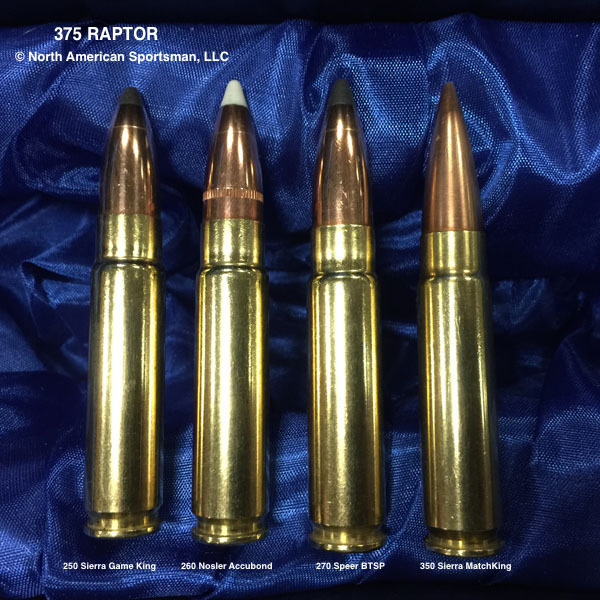 Since the release of the 375 RAPTOR, we have found these bullets to be the optimal based on continual testing and in field hunting performance of numerous game animals. Muzzle Velocity and Muzzle Energy are only two indicators of performance. In speaking with engineers at Nosler, Sierra and Speer, there is concurrence that rifle hunting bullets require a minimum on target velocity of 1800 fps to insure reliable expansion. Using an expansion factor of 1.5 times caliber, the .375 caliber achieves an expansion of .5625 inches which is exactly 9/16 inch for those that prefer fractional measurements. Historically, if we look at cartridges that have stood the test of time as great hunting cartridges, we see a common performance characteristic of bullets fired from these cartridges impacting the game at a terminal velocity of between 1800 and 2400 fps which allows the bullet to reliably expand without over penetrating so the full kinetic energy of the bullet is transferred to the game animal. Actual in field hunting performance has proven the 375 RAPTOR’s ability to deliver 200 to 300 grain bullets on target at this ideal velocity window. 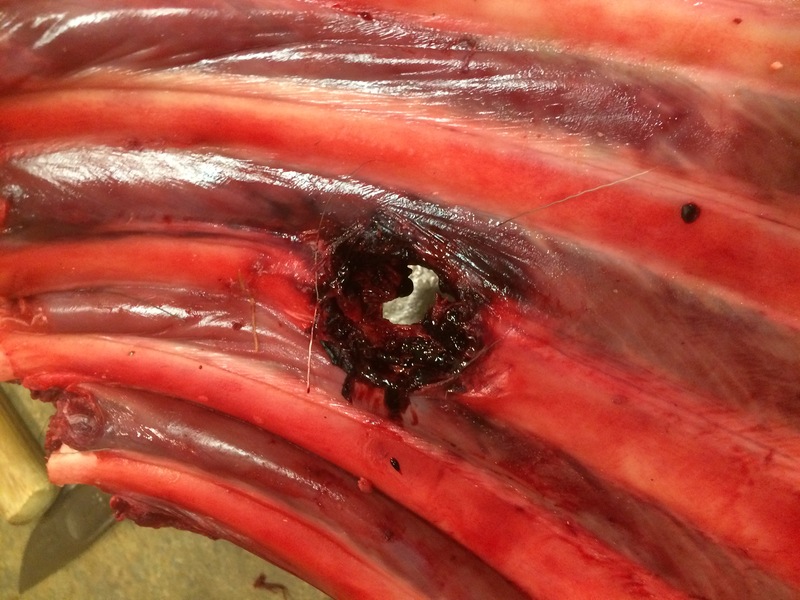 Entry wound on Alaskan moose from 375 RAPTOR using 260 Nosler Accubond. A common question is what bullet someone should use for a particular type of hunting. Taking the experience gathered through development and the actual hunting of many game animals across North America and South Africa, here are a collection of thoughts and opinion. The Nosler Accubond is a bonded core ballistic tip suitable for anything including Elk, Moose and Bear. The bullet has a .473 Ballistic Coefficient which will give excellent velocity and energy retention. This ballistic coefficient is comparable to what you will find with many common 7mm and 308 bullets and the 375 RAPTOR can push this 260-Grain bullet at the same velocity that the 308 Winchester can push a 175-grain with barrel lengths being equal. If you prefer or are required to use lead free bullets, the Barnes 250-Tipped TSX is a proven mainstream manufacture bullet. It has been used successfully in the 375 RAPTOR to take both Grizzly and Caribou with accurate humane shots. Another option for lead free bullets is Lehigh Defense, https://www.lehighdefense.com, who makes a number of Solid Copper and Brass bullets ranging from 175-grains to 336-grains including match solids and controlled fracture designs. All three of these bullets are suitable for whitetail deer and feral hogs. They are economical bullets with the 235 Speer available for 30-35 cents per bullet and the 270 Speer available in the 50-55 cents per bullet price range from well known mail order shooting sports supply stores. Many hunters have found the the 235-grain Speer does an outstanding job when muzzle velocity is held to between 2500 fps and 2600 fps even when used in the 375 H&H Magnum and the 375 RAPTOR drives the 235-grain Speer right in this sweet spot of muzzle velocity and does so with an 18-inch barrel. The Swift A-Frame and Nosler Partition are both highly respected controlled expansion bullets and provide a good balance mass with the allowable powder capacity that make either bullet an option at ranges less than 100-200 yards depending on barrel length. The Nosler 260-grain Accubond is a bonded core bullet suitable for use on many African and North American heavy game animals for that first penetration shot with expansion. Due to its high relative ballistic coefficient, the Nosler 260-grain Accubond extends the range capability of the Nosler Partition and Swift A-Frame. Many hunters back up a controlled expansion or bonded core bullet with a brass solid and the Nosler 260-grain solid performs extremely well driving in deep on the toughest game animals. Recoil is very manageable in a light carbine allowing quick follow-up shots. Notice – No bullet manufacturer has provided compensation or consideration to be listed. We speak based on knowledge from purchasing bullets (just like you do) and doing our own evaluation and experience. Changing barrel length from 10.75 to 18 inches, the velocity shift will typically be 20-30 fps per inch. On barrels longer than 18 inches, the velocity shift averages 12.5 fps per inch of barrel up to 22 inches. For the majority of users, an 18-inch barrel is optimal. However, if you see that you will need to take hunting shots at 250 to 400 yards, then a 22 inch barrel could be ideal. Wesley Hitt of Omega Rifles demonstrating their Tac Lite Bolt Action with the new Bowers titanium baffle suppressor shooting the 375 RAPTOR with a Barnes 250 Tipped TSX Boat Tail loaded supersonic. The Omega Tac Lite is a precision bolt action that can change barrels in minutes with the 308 Winchester, 6.5 Creedmoor and 375 RAPTOR as standard cartridge offerings. 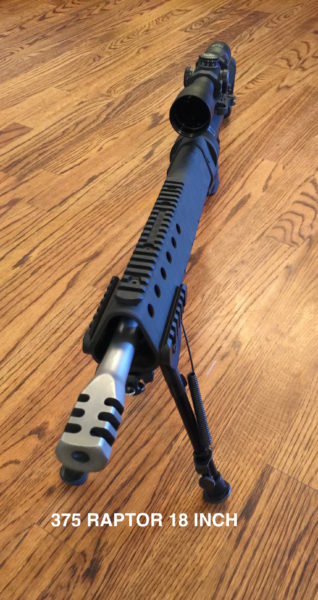 In addition, Omega Rifles is offering loaded 375 RAPTOR ammo and their new LR308 complete rifle and uppers. 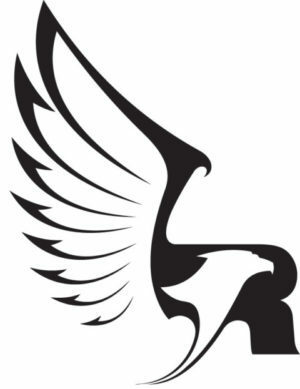 The follow document compares the 375 RAPTOR to multiple other Big Bore cartridges available in modern sporting rifles. Calculations were performed using JBMBallistics.com using published data.